Also see the new Weemans at number 425 Gallowgate originally Mac's Bar. There has been a pub on this site since the early 1800s. In 1891 John McConnell completely overhauled the old pub making major alterations to the interior. The bar counter was close to 40 feet in length extending from one end of the bar to the other. The old family department was also modernized. Before Mr McConnell took over the pub he was manager of Flynn's bar in the east end of the city, he was also an expert blender of whisky. Mr McConnell was born in Ayrshire in a small town called Sorn, Catrine, at an early age he came to Glasgow and worked in some of the best bars in the city. Mr Connell only lasted a few years in this pub on the Gallowgate and sold it on to Patrick Cassidy in 1894. A few years later Mr Cassidy took over a small pub in Camden Street, Gorbals. He ran the Gallowgate pub until 1921, he gave up the licence to concentrate of his other premises on London Road. The licence was then taken over by Dominick J Muldoon, Dominick had experience in the licensed trade as he ran a pub in Gairbraid Street, Maryhill beforehand. He also owned pubs in Crookston Street, Stobcross Street and Gallowgate near to the corner of Fielden Street. The pub was known by the title of Muldoon's. Dominick was refused the licence at Crookston Street for permitting a man to consume liquor on the premises after 9pm and fined 4 Guineas. Daniel Muldoon took over the licence after his fathers death in 1931. The pub was still in the Muldoon family in the early 1940s. In 1947 the name of the pub was changed to the Wee Man's, by the new landlord John Young. Mr Young served the locals in the Wee Man's for 30 years. 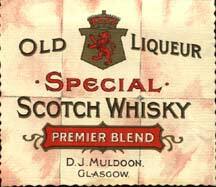 D J Muldoon's Special Old Liqueur, a whisky label found by an old friend of mine Wully Gallacher, in the Wee Man's in the 1980s. Mr Joseph Rock took over the Wee Man's which was on a short lease as the Glasgow District Council had plans for the surrounding ground that the pub sat on which included the sit of the Rob Roy bar which was already closed down. The two pubs were finally demolished a few years ago, the land is still lying derelict. It was such a shame to see two of the Gallowgate's best known pubs pulled down. Mr Joe Rock changed the name of the Auld Hoose (Mac's Bar,) to the Wee Man's a pub which sits further along the Gallowgate near to the corner of Graham Square. Members of the Licensed Trade Defence Association 1959. left to right C McCabe, Shakespeare Bar, Norman MacLeod, Townhead Cross Bar, Donald A MacLean, Coronation Bar, Edward Barrett, Halfway Bar, Rutherglen, Joseph McCabe, Kick Off Bar, J R Steedman, Burns Bar and John Young, Wee Man's. Left to Right D D Rennie, Booths Gin, John Young and John E Jackson. 1962. 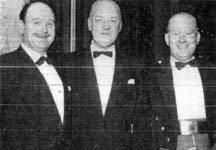 Left to right at the Glasgow and District Licensed Trade Association, Thomas F Flynn, R W Nimmo, A Stewart, George Grier, R B Paxton, John Young, Donald MacLean. 1960.